The electric-powered drone can be fully charged in two hours, carry up to 220 pounds and fly for 23 minutes at sea level, according to Ehang. The cabin fits one person and a small backpack and even has air conditioning and a reading light. With propellers folded up, it's designed to fit in a single parking spot. After setting a flight plan, passengers only need to give two commands, "take off" and "land," each controlled by a single click on a Microsoft Surface tablet, the company said. It is designed to fly about 1,000 to 1,650 feet off the ground with a maximum altitude of 11,500 feet and top speed of 63 miles per hour. U.S. authorities are just starting to lay out guidelines for drone use, and a human-passenger drone seems certain to face strict scrutiny. 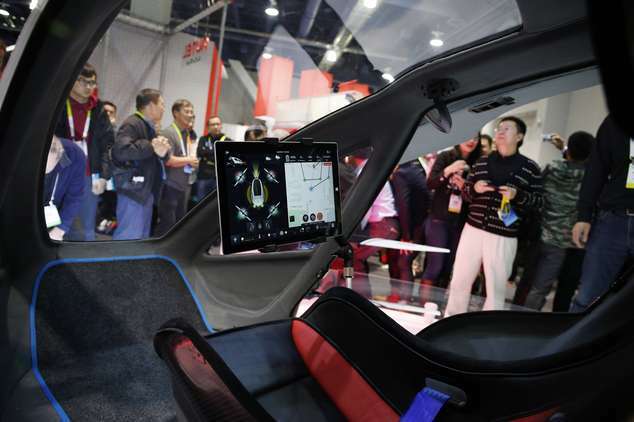 Federal Aviation Administration administrator Michael Huerta was at CES but could not immediately be reached for comment through a spokesman. 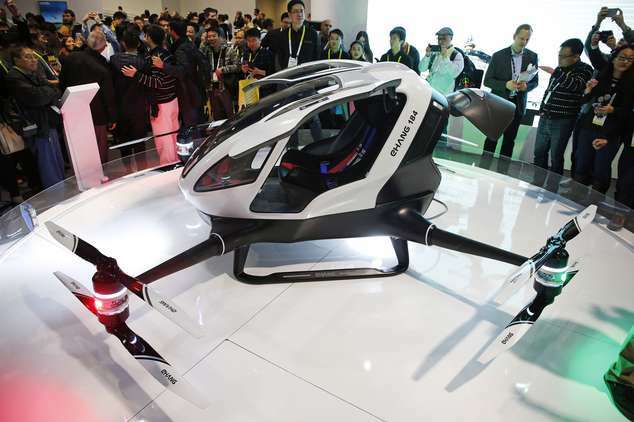 Ehang co-founder and Chief Financial Officer Shang Hsiao said the company hopes to sell the device for $200,000 to $300,000 beginning this year but acknowledged it occupies a legal "grey area." "The whole world never had something like this before," he said. A passenger would have no controls as a backup, he said. In the event of a problem the company plans a remote control center that would take over the vehicle and ensure it lands safely, he said. 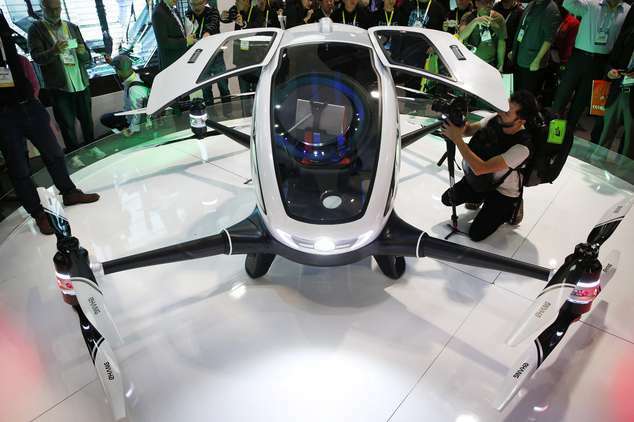 Chief Marketing Officer Derrick Xiong said the vehicle has been flown more than 100 times at low altitudes in a forested area in Guangzhou, including several times with a person inside. One thing that makes quad-copters safer than helicopters are its numerous propellers, Xiong said. Even if three of the four arms have their six propellers disabled, the final arm's working propellers can ensure a rough landing by spiraling toward the ground, he said. The company, which also makes smaller drones, said in August it had raised $42 million in capital from various investors including GP Capital, GGV Capital, ZhenFund and others, following $10 million in capital raised the previous year. Is that each or total ?? Hello John. Shopping for a new toy? Since the total power consumption is 14.4kwh, it would be for the 8 motors. Since it's "point and click": Definitely an application. There need to be controlled landing/parking zones* for these in any case. Having everyone fly around with 8 exposed rotors that can land anywhere would be a recipe for mayhem. *And some form of automatic air traffic control/pathing that coordinates them once more than two are in the air. Hack the control center and kidnapping people who have enough money to buy one of these becomes almost comically-easy. Or just wait and see if the rate of successful emergency landings (i.e. those that the rider survives) is the same among people the Chinese government considers troublemakers as it is among those it considers "good citizens." Of course, that assumes one is not experiencing a major malfunction at ~1500' while the control center is also coincidentally experiencing it's own glitch(es). It'll give a whole new meaning to the phrase "down time," especially if it happens at rush-hour. In any case I bet the U.S. Dept. of Homeland Securitytheater is *thrilled* about the development of slow-speed, autonomous aerial vehicles capable of delivering a 220-lb. payload ~20 miles away in ~20 minutes. I don't see the parachute pack for the unit. If this thing goes haywire in the air, I wouldn't want to be bailing out with 6 or 7 of the spinning props whizzing around me. If this thing goes haywire in the air, I wouldn't want to be bailing out with 6 or 7 of the spinning props whizzing around me. That's the problem with helicopters. I don't see the parachute pack for the unit. As they note: the thing can land (albeit hard) if at least one rotor is still working. But as long as the control units are redundant and the power units are distributed that shouldn't be a problem. As these things travel at around 1000feet I wouldn't sweat packing a parachute in any case. By the time you notice that something is wrong, removed the safety belt, opened the door and have exited the canopy (assuming you already donned a parachute when entering) you're way too low for a parachute drop unless you're trained for this kind of thing. A passenger would have no controls as a backup, he said. Was reading that a S A city is the helicopter capitol of the world, Sao Paulo, and that is probably going to be the first take over target for drone chops. "One thing that makes quad-copters safer than helicopters are its numerous propellers, Xiong said. Even if three of the four arms have their six propellers disabled, the final arm's working propellers can ensure a rough landing by spiraling toward the ground, he said." That's mechanically impossible; one impulse source at the end of a lever and well away from the center of mass? Tthe only thing that's certain to happen during a three-spar full mechanical faliure is unconsciousness due to centripetal black-out before you die at whatever acceleration is achieved before this thing cart-wheels into the dirt. Let's hope this is a translation error. If it's carrying a human then it isn't a drone. Evolution in action. Anyone stupid enough to fly in something with Microshaft software deserves to be eliminated from the gene pool. Never ceases to amaze how people design critical systems for radiation therapy, chemical plants, now flying "cars"...and don't consider it critical to use an OS that can manage memory properly, actually multi-task and doesn't obscure core OS code and functionality. The human isn't flying it, so it's a drone. Maybe bother to look up basic definitions before promulgating your wisdumb? lol If someone shoots my corpse into space on a rocket is that "manned space flight"?